Tomorrow, January 2, at 2 PM EST: Tune into KBAI 99.5 fm (available online at WBAI.org!) and hear TRP’s own Peter Carlaftes and Angelo Verga talking about Charles Bukowski on Janet Coleman’s Cat Radio Cafe show. Call in with comments! 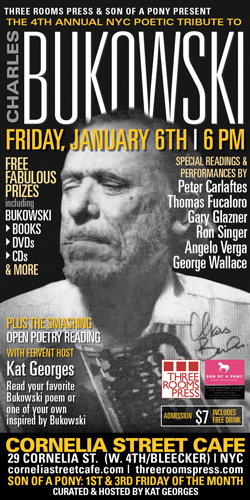 And be sure to join us on Friday at 6pm at Cornelia Street Cafe for the 4th annual NYC Bukowski Poetry Tribute. Details in this week’s New Yorker magazine (how cool is that?! ).